The nationalism debate that has been stoked by the BJP ever since the JNU incident is another sign of the dangerous path that the Modi’s govt. is threading in its desperate attempt to maintain its hold on power. However faced with bleak economic prospects and a monumental failure in governance, the writing on the wall is becoming increasingly clearer to the working people and different oppressed sections of this landmass called India. On March 22, 2016, Appa Rao, the disgraced Vice Chancellor (VC) made a sudden reappearance to the campus after a two-month long absence. Students of the University of Hyderabad (UoH) protested against his resuming office as he was one of the main culprits in the institutional murder of Rohit Vemula. The media have not spoken honestly on the 22nd March incident at the VC’s office. There was indeed some scuffle between students and non teaching staff (which included ABVP students among them) in front of VC Lodge. Only the front glass panel was broken in the push and pull. However pinning the blame on the students for the reported damage to property including damage to sofa, wall drop, LCD screen television and many other items is highly questionable. The role of non-teaching staff & ABVP, who are in cahoots with the VC, has not been officially probed so far. The police brutally assaulted and attacked students in front of VC Lodge as a result of which they arrested 24 students, 2 faculty members and 1 media person. Those arrested were beaten black and blue inside the police van and they were being shifted from one police station to another. For almost a day their whereabouts were unknown and other students had to run from pillar to post in search of the arrested students and faculty members. 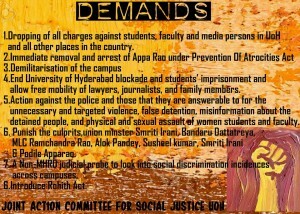 Within the university campus, Appa Rao launched an undeclared emergency by cutting down Internet, water and electricity. To add to our woes he even ordered the university messes to close down and not provide food for the students. There was a lot of disorder, dismay and confusion among student community with regard to this outrageous behavior of the VC. In addition, he even played the trick of closing down all the restaurants that are situated within the university campus. Hence, all the students were completely stranded in the campus. Following which the Joint Action Committee for Social Justice – UoH (JAC-UoH) decided to cook food near the shopping complex. However, the police objected to even this and they threatened and asked us not to cook, instead go out of the campus to have our meals (which is a long distance from the University). Such was the cold and insensitive environment that had been established due to which students had to suffer from all kinds of difficulties. Further, Appa Rao and his company decided to block all the media personal, political parties, social activists, political leaders, human rights defenders, parents, and advocates from entering the campus premises. Students had to go outside the gate in order to talk to anyone. 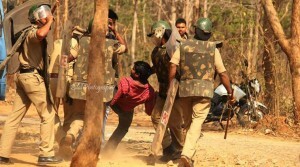 In addition, the entire university campus was flooded with police and security who were interfering with the regular activities of the students. There were restrictions with our right of movement within the campus and we were specifically restricted from entering the administrative building or even be around the administrative block. Further, the official University website, Facebook page and Twitter were misused by the VC to spread false information about students and their activities within the university campus. He used these social media platforms to leverage his stand and justifying the brutal attack on the students and faculty members. Under the leadership of JAC-UoH, students of the university engaged in community cooking as the messes were closed on the orders of Appa Rao. In addition, every day we have protested, we have demonstrated, held rallies, a candlelight march, an effigy burning of Appa Rao, sloganeering throughtout the university campus and beyond. Many students expressed their opinions by writing in print and electronic media, sharing the information on social media websites such as Facebook and Twitter. Many students and the JAC, UoH members were interviewed by different media agencies. Similarly, every day an event called as ‘Ekalavya Speaks” is being organised. In this program students and faculty members speak about their experiences, thoughts, opinions about the movement. Apart from this students have been constantly engaged in preparing and designing posters, banners, placards etc. On 28th March students of the University of Hyderabad voluntarily boycotted the classes as an appeal was given by JAC-UoH. 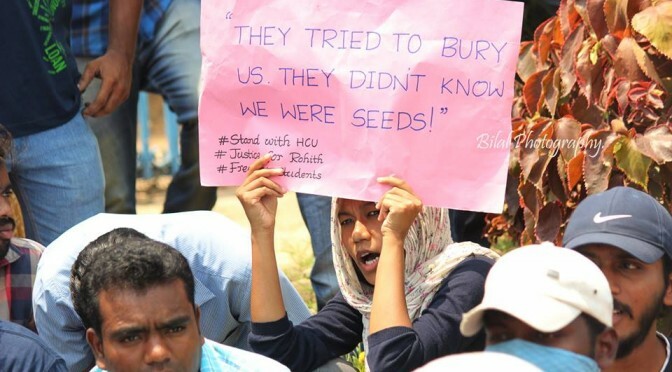 Students went to class in the morning for the first period as usual, however when the teacher entered the classroom they all stood up and informed the teacher that their faculty members and co-students were arrested and hence as a mark of protest they would voluntarily boycott the classes. In some classes the teacher was about to begin the class when some other classmates sat outside the classroom near the door. Noticing this the teacher was informed that they cannot sit in the classroom while their friends are in jail. The voluntary boycott of the classes by the student was successful and students joined near Vellivada (where Rohith Vemula and his comrades had protested against their suspension) in protest against Appa Rao and his company. Further the students went outside the main gate and staged a demonstration highlighting their demands and insisted that their main demands be fulfilled at the earliest. Later students rallied with slogans towards administrative building and sat in front of the entrance. Students were addressed by the University of Hyderabad Students Union President. This was followed by a play written and performed by the Progressive Theatre Group (PTG), University of Hyderabad on the brutal attack by police on the students and the ploy of Appa Rao in all these events. 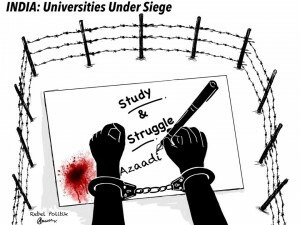 On this very same day, the court granted bail to all the faculty and students who were arrested. However, the movement will not come to an end as the demands of students are not fulfilled by the university administration and the central government.